The story is set in a fantasy world where futuristic technology and ancient magic exist simultaneously. A powerful sorceress is set on not only controlling this world, but completely destroying it. Gardens are large military academies that train young mercenaries to handle the political conflicts between nations. You play Squall, a social loner and recently inducted mercenary of said academies. A simple mission will turn into an epic journey that will change Squall's character and uncover the world's vivid history. Gameplay consists of exploring a world and interacting with characters with your third-person avatar, turn-based battles on a separate screen, and various minigames along the way. The specific battle system is unique though. The mana-based magic system is out. Its replacement is the Junction system, where magic is stored, like ammo, and can be connected to a character's stats to make them more powerful. Guardian Forces (summons) are also junctioned, and they allow characters to use new battle/field abilities. Some claim that the Junction system was a broken battle system because you could make the game too easy. I disagree. It still took work to over power your characters, and it was a lot more fun than the mindless level grinding featured in other games. Enemies level up as you do, the game still poses a challenge. The Junction system is meant to help you. If you felt it was easy, it's because you took the time to understand the junction system and played the game well. Furthermore, the junction system, in combination with GF abilities, item refining, and the card game, added multiple levels of customization to the game. This high degree of customization has lead to the large number of play challenges, strategies, and discussion online. There are many ways to play and definite replay value. Final Fantasy VIII (FF8) had a lot to live up to. Its predecessor, Final Fantasy VII (FF7) was the best-selling game in the series, as well as the game that made a noticeable shift in the series by switching to 3D models and a modern setting. FF8, having the same team as FF7, tried out a lot of new things with Eight, such as an innovative battle system, focus on body language, and a storyline about love of varying sorts. Back then, FF8 was highly criticized, mostly due to its immediate comparison to FF7. 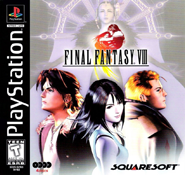 Nowadays, FF8 is generally looked upon fondly and considered by many to be part of Square's RPG Golden Age. After being released on the Playstation Network, it landed in the US PSN's top downloads for 7 months after its release, which is more than the average game to make the monthly list. That's a lot of nostalgia.